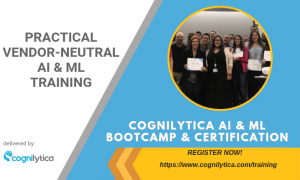 Cognilytica’s AI & ML Project Management Certification Boot Camp is recognized around the world as one of the best AI & ML as related to Project Management training course available anywhere. The training is an intensive, three day “fire hose” of information that prepares you to succeed with your AI & ML efforts, whether you’re just beginning them or are well down the road with implementation. Cognilytica’s training reflects the industry’s best practices and methodologies and the latest research that Cognilytica produces.